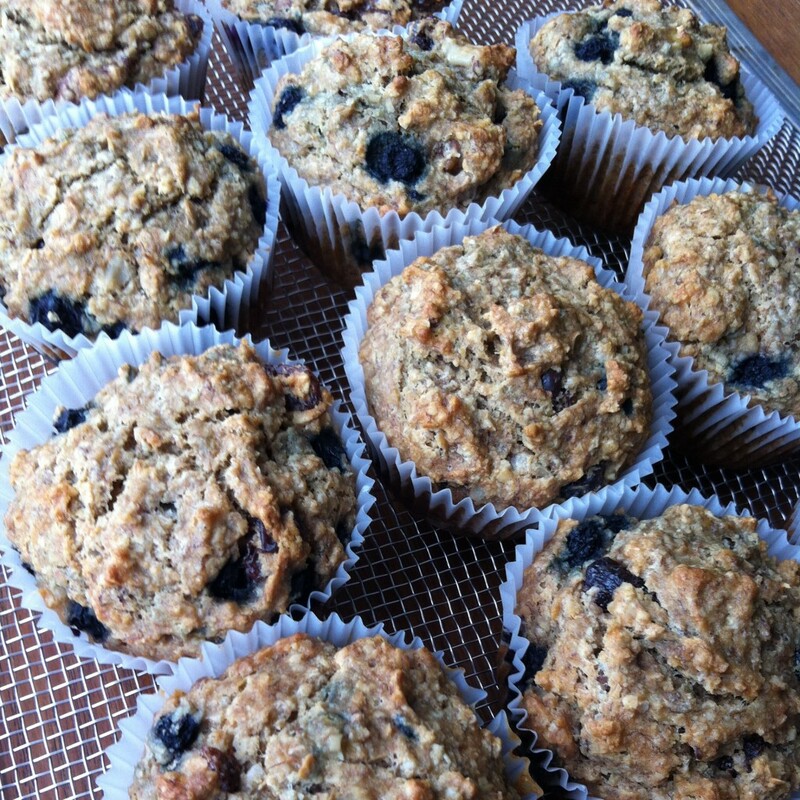 2 in 1 Vegan Banana Blueberry Muffins or Pancakes - U-RAAW! 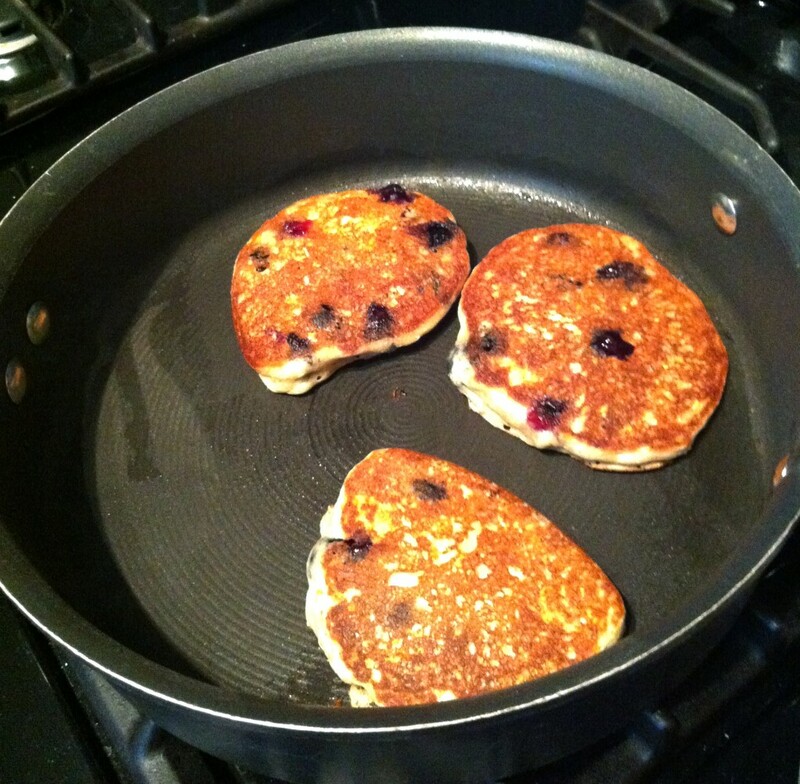 Banana blueberry pancakes or muffins? You decide. 1 recipe, 2 options. Who doesn’t like options? 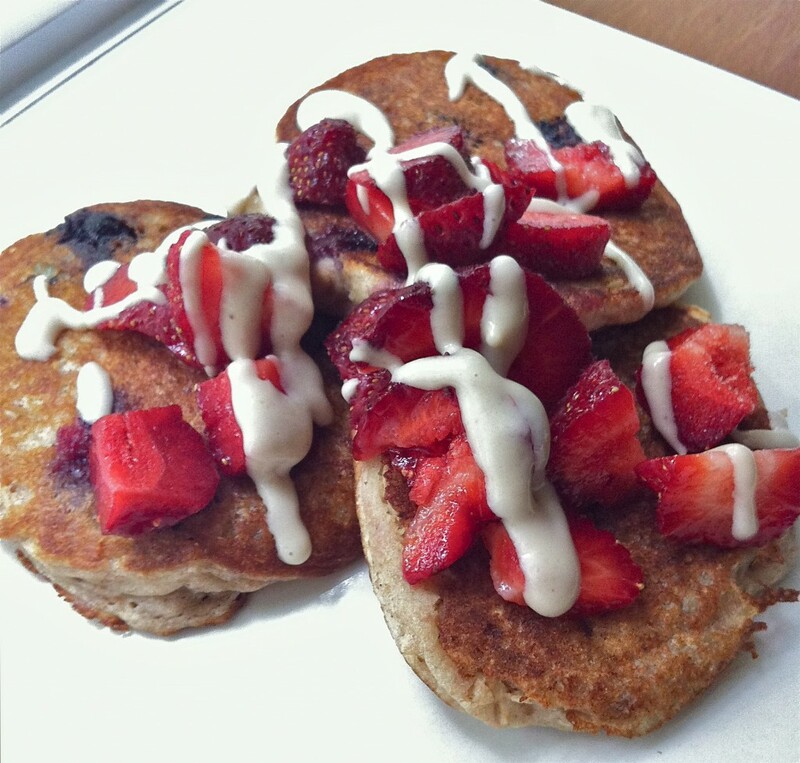 This is a very versatile, simple recipe that can be used to make either vegan pancakes or vegan muffins. Whole-grain, no sugar added (or artificial sweeteners), dairy-free, egg-free, soy-free, and potentially gluten-free, depending on what flour you use. *I use banana in place of egg for this recipe, so it’s perfect if you have a couple browning bananas sitting around that you’re not sure what you should do with. The bananas make both the pancakes and the muffins moist and banana bread-like. 1. Combine dry ingredients in large bowl and give a quick stir to assimilate all ingredients. 3. Pour blended wet ingredients into bowl with the dry ingredients. Stir gently until all lumps are gone and you have a nice batter. If it is looking a little too thick, add a little more almond milk until you achieve an ideal consistency. 4. Add 1 cup wild blueberries (or non-wild, organic for sure) and very gently fold into the batter. If your blueberries came frozen, defrost them first. I like to add chopped pecans at this point as well, but this is optional. Line muffin tray with paper muffin cups (for easier clean-up. Or you can use a non-stick muffin tray and lightly oil it with coconut oil). Fill cups 2/3 of the way full. 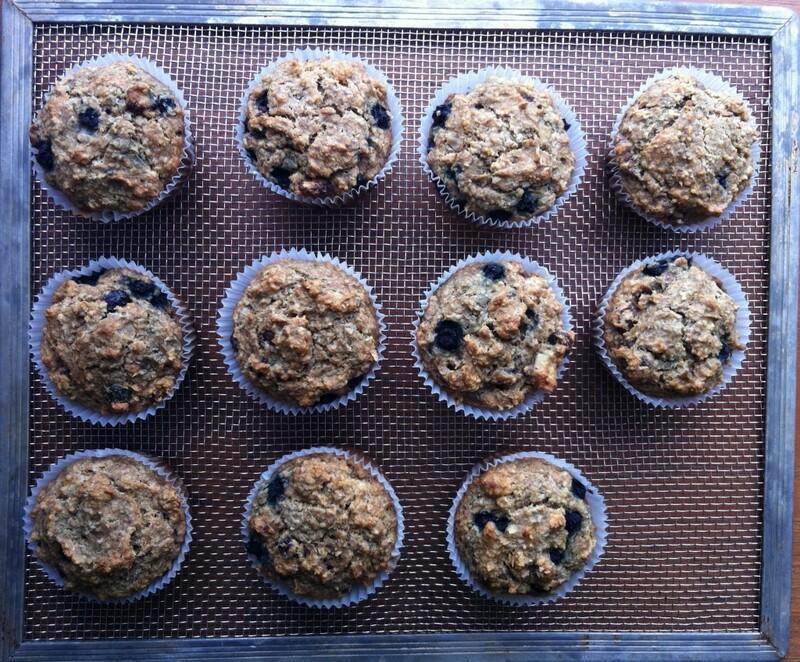 Bake for about 20-25 minutes or until muffins are spongy and golden brown. Remove from oven and let cool for at least 5 minutes. You may need to add just a little more almond milk to your batter to thin it out. Your call here. Preheat griddle/flat bottomed pan. You want it hot, so that drops of water sizzle and disappear. Add a little coconut oil. Measure about 1/3 cup batter per pancake (depending on what size you want them). Griddle those suckers until golden brown on each side! 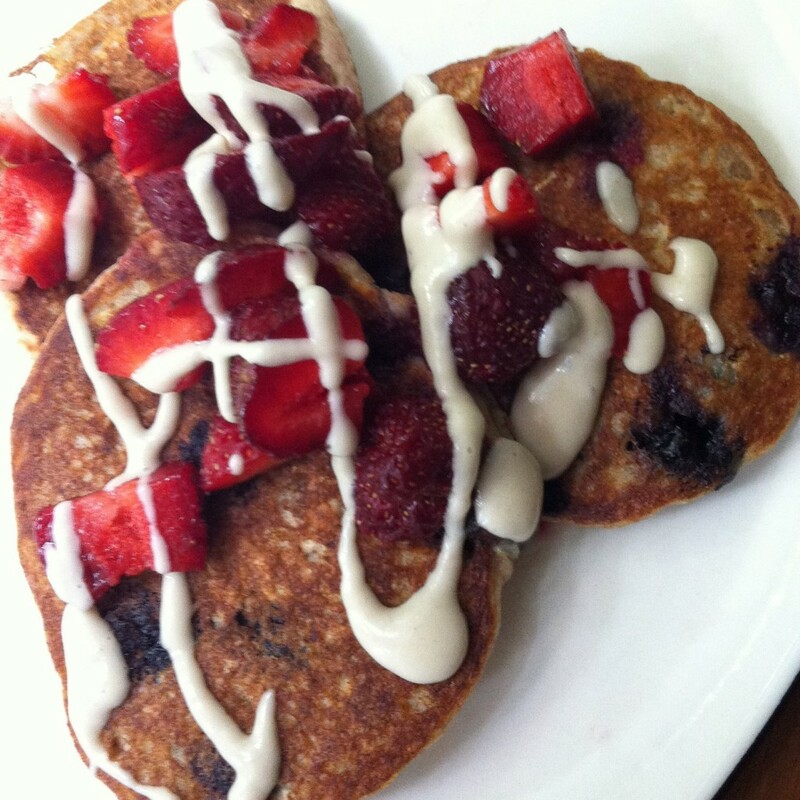 I topped these pancakes with fresh organic strawberries and vegan cashew cream. BLEND/puree ingredients until smooth and creamy. Laura Franklin is our resident Holistic Nutritionist and nutritional consultant. Laura has been involved in sports and fitness from a young age and has always had a personal interest and passion for healthy living. She recognizes the importance of a diet rich in of a variety of nutrient-dense foods and the positive impact it can have on total body wellness. Laura believes the three keys to a healthy mind and body are eating well, laughing lots, and moving your body!